India has stolen our hearts. 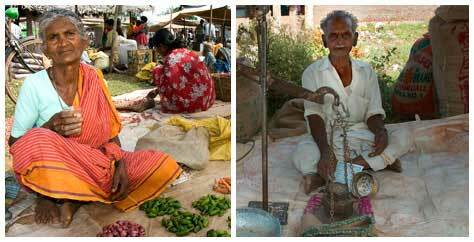 Our first trip to India in January 2006 was a great success. 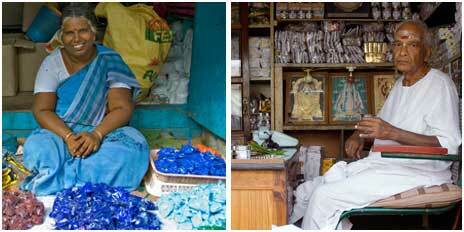 We visited North India, Rajasthan, Agra and Varanasi (see travelogue). Rajasthan is India's most colorful and exotic state. The fairy-tale palaces, the massive forts and ornate clothing of the population are a feast for the eyes. 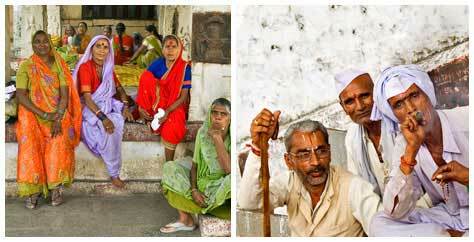 Rajasthan evokes the image of classical India. 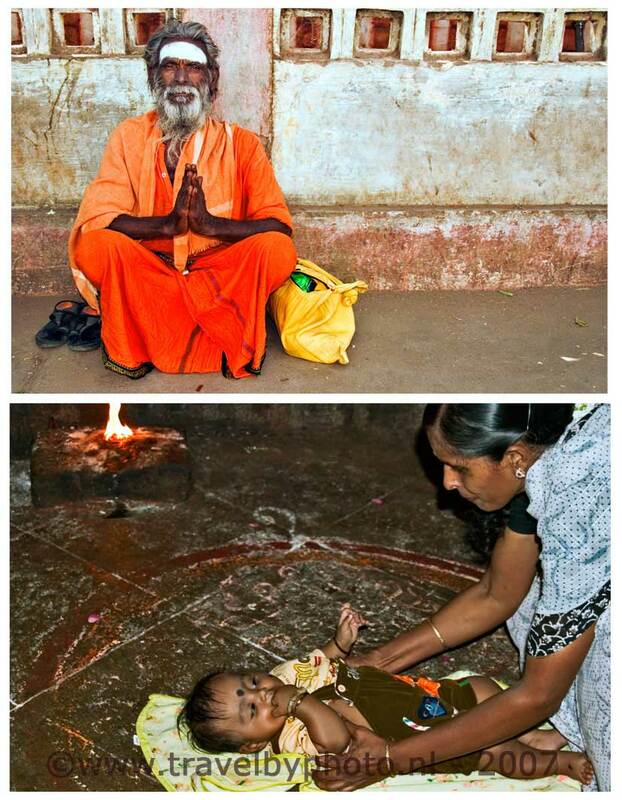 The country where Hinduism in its traditional form survives. 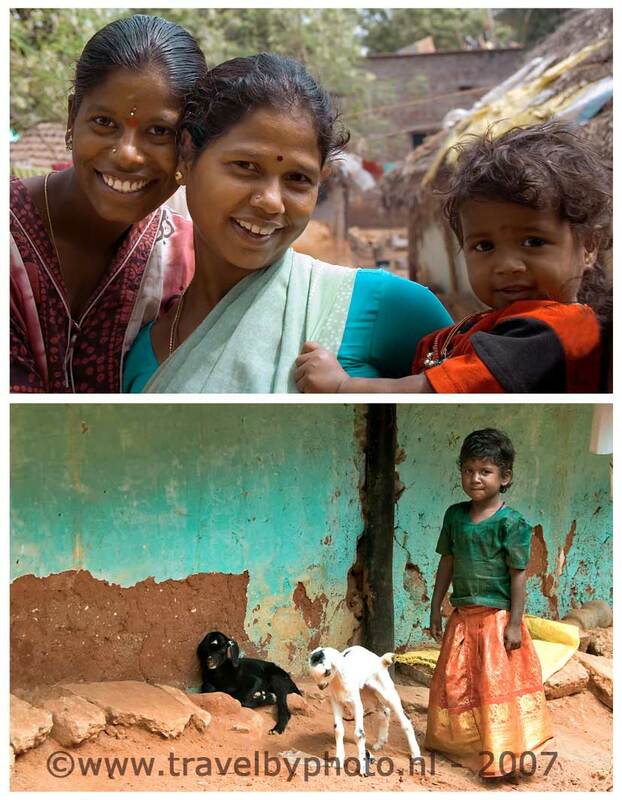 We were touched by the kindness of the population and were determined to come back to India. 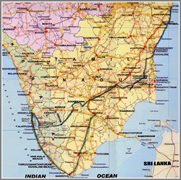 We chose for a trip to the South of India. After the necessary preparations at home, we are ready. 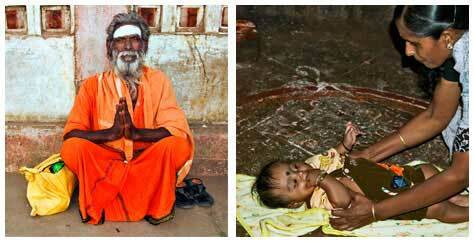 At Shoestring , a Dutch travel agent, we book a 23 day tour: Thali and temples in the tropics. 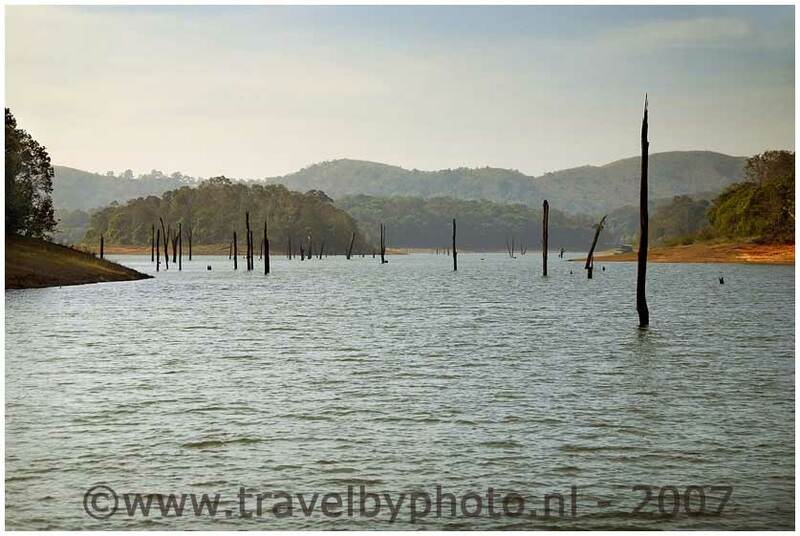 A tour through the states Tamil Nadu and Kerala. We have to be at Schiphol airport Amsterdam at 5 o'clock in the morning! Jan Daalmeijer, a friend of us, has kindly offered us transport to the airport Schiphol! Fortunately we are on time. We fly with British Airways from Amsterdam to Chennai with a stopover at London Heathrow. When we approach Heathrow the aircraft can’t land immediately. The result is that we fly 2 extra laps low over London. Our first excursion! We can clearly see all the tourist attractions and the Thames. Unique of course but we're concerned because we do not want to miss our flight connection to Chennai. Fortunately that doesn’t happen. On our flight to Chennai, we sit close to two fellow passengers of the Shoestring group. The rest of the group (8 persons) travels separately from us with Lufthansa. At half past 2 in the night we arrive in Chennai. We are transferred to our hotel for a short night. The rest of the group stays in a different hotel, apparently there was not enough room for us all. Around 10.15 am, the rest of the group arrives at our hotel and we meet our guide for the first time. 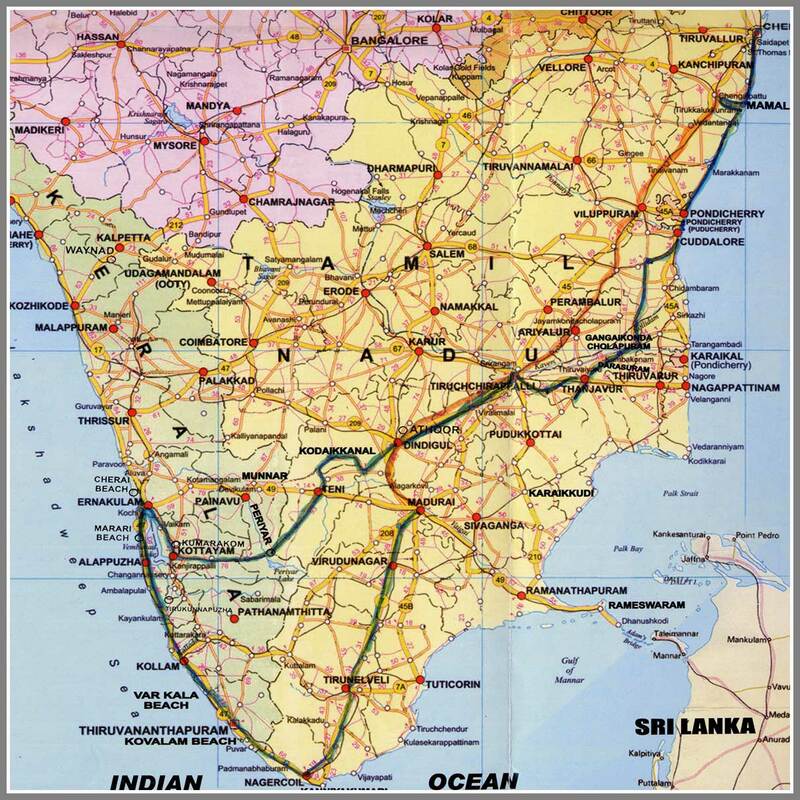 We do not stay in Chennai but travel straight to Pondicherry. Traffic in Chennai is chaos. We drive out of town and visit our first temple of the journey. Forgotten the name of the place, but it was a nice temple where unmarried women and girls walk around the temple and make offerings in the hope that they will find a good man so they can have a happy life. We have lunch in a vegetarian restaurant where many local people are. Always a good sign if a restaurant is frequented by Indians themselves. It is very busy in the restaurant. Waiters are continuous running forth and back to refill the dishes, clean the tables and serve new dishes. Food in India is delicious. The restaurant serves Thalis, a large aluminum tray with a banana leaf on it. On the tray are small containers with a pickle, dahl, curd, vegetables and a (sweet) chutney. Rice is thrown at the centre of the dish. You also get papadums or chapatis. In the restaurant we get information from 2 Dutch (!) HBO students who launched a project designed to help tsunami affected fishermen to earn some additional income. At a later moment this journey we’ll go with these fishermen out to sea. During the tsunami, many fishermen's cottages are destroyed. They got new homes. The new houses are build with money of western aid organisations and are for safety reasons build at some distance from the sea. 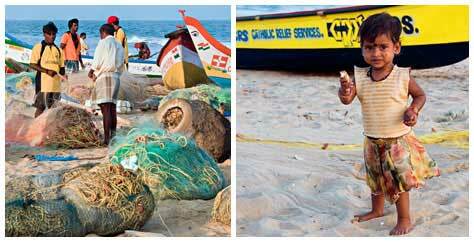 But as often happens when no locals make the plans, the plan doesn’t meet the needs of the fishermen. They live for many generations from, with (the dangers) and at the sea. So they do not want to live in houses far from the sea and return to their old (destroyed) villages. En route we stop at a temple. 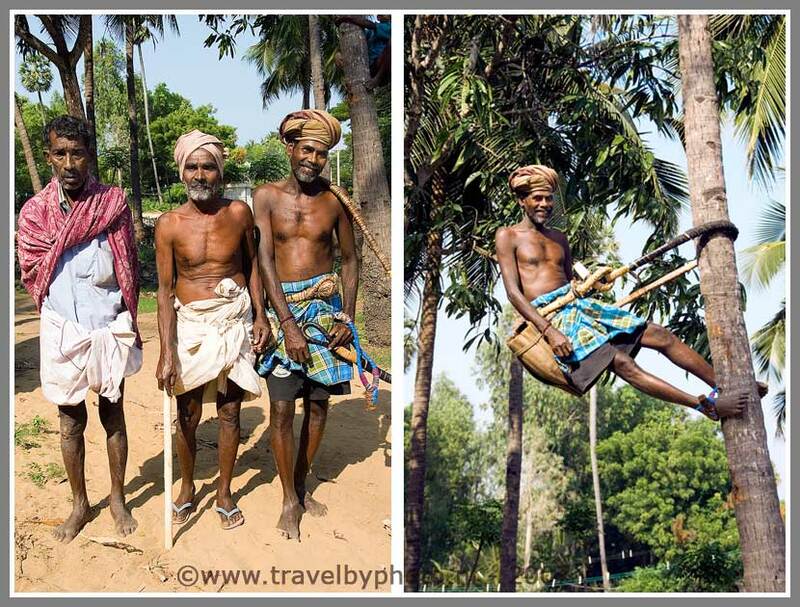 Even more interesting than the temple is a man who climbs incredibly fast in a coconut tree. We also see a poultry farm, many ibises, palm tree plantations and small huts. Finally we arrive at our hotel in Pondicherry. The hotel is considerably better than our previous hotel in Chennai. Our tour guide - Muthu - gives a briefing on the tour in the lobby and displays information about excursions. We have to get used to his Indian English; funny but also very special and at first difficult to understand. Our suitcases are brought to our room. After a quick shower we leave the hotel for a walk in the centre of Pondicherry. 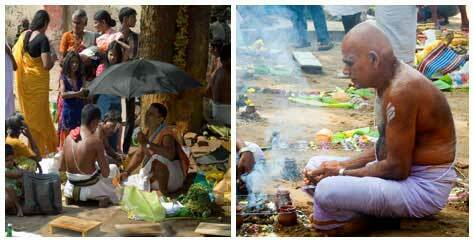 Many people on the street, different colors, smells, noises and lots of richly decorated temples. In the evening, we drink some wine. We know that wine is almost impossible to get in India, so we brought a few liters of wine with us from Holland. Slept well. Breakfast with warm toast. Very cheap all. 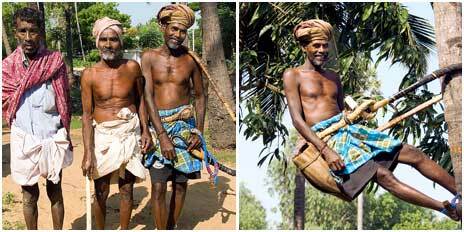 There is excursion organized to Auroville, but we will not go. 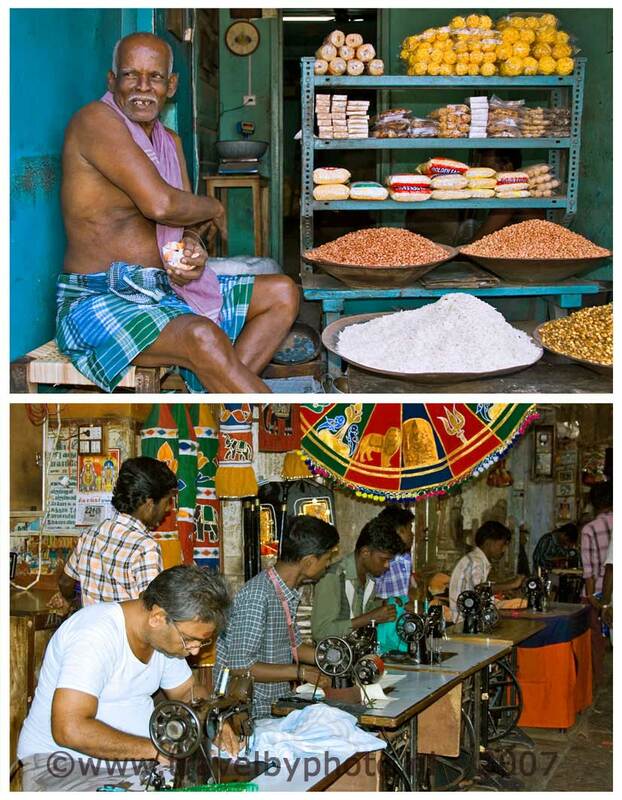 We want to spent some extra free time in Pondicherry; a former French enclave. You see many French influences in the city, French street names, croissants and policemen in French-style uniforms. We arrive at a Sunday market. We wander through the streets and watch the people. Some people are sleeping in the street. We see a funeral procession for a young child. First we think it is a kind of cheerful celebration until we see the child laid out on a stretcher. People scatter petals around. We find a delicious French / Indian eatery on a rooftop terrace and eat with gusto. We pass a temple. There are many emotional people at the entrance of the temple. Offerings and a bin with fire from the temple is placed in a small car. The car is covered with many flower garlands. People explain that there is a long journey to make. The next morning around 5 am, families from this neighbourhood will have a punja on top of a hill. The car is bringing the offerings and the fire from the temple to that place. Nice people. 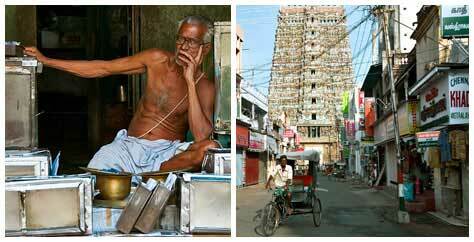 We leave after breakfast at half past 8 a.m.
We first look at a temple in the town Kumbakonam. 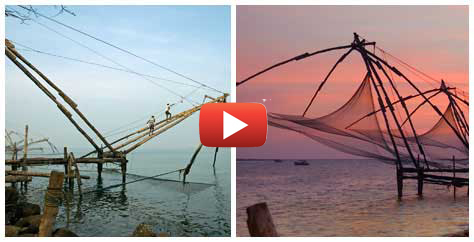 We visit a village and , and a fish market. The people are very nice and they don't mind that we take a picture. We also visit a second temple. Today is a long travel day but the driver is good and the bus is comfortable. There is so much to see outside! 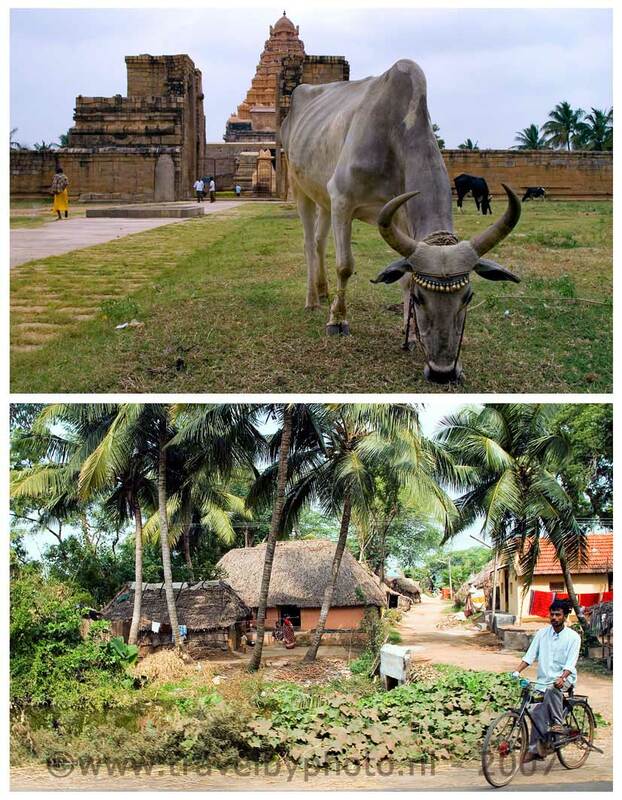 Ox carts, filled with branches and sand, many huts of mud and palm leaves, small lakes with lilies, broken roads with lots of dust and sand. People at work on the land. We had a delicious vegetarian lunch. We felt 3 rain drops, but otherwise it's lovely weather, not too hot too. The temples are beautiful. All the temples are open for visitors as long as you enter the temple barefoot. At the end of the afternoon we arrive at the hotel in Tanjore. A reasonable hotel. We do ask another room because there has been a leakage and the room therefore smells very musty. We eat in the hotel. After dinner we go with a few others members of the group to the bar of the hotel for a drink. We see red wine on the map. When we order, the wine turns out to be a kind of cocktail. The only resemblance with the wine is the red colour! Ingrid sees a rat. Later more people see rats rushing around. One of the curtains is moving, and yes, the rats have a highway behind the curtain! Some hilarity and feet are hold high. On leaving the bar we inform the man of the hotel of their uninvited guests behind the curtain. The man just smiles and says that he knows that there are rats, pointing toward the corner with the moving curtains. He doesn't see the problem they don't harm people. After such an incident and the reaction of the barman you know for sure you are in India. After breakfast we go to the great Shiva temple nearby. We are blessed by an elephant. The temple is beautiful. There are a lot of pilgrims with shawls in various colours. Black, orange and green. We roam around the temple for a while and are fascinated by the sincere manner in which the pilgrims live their religion. After our visit to the temple we visit a market. 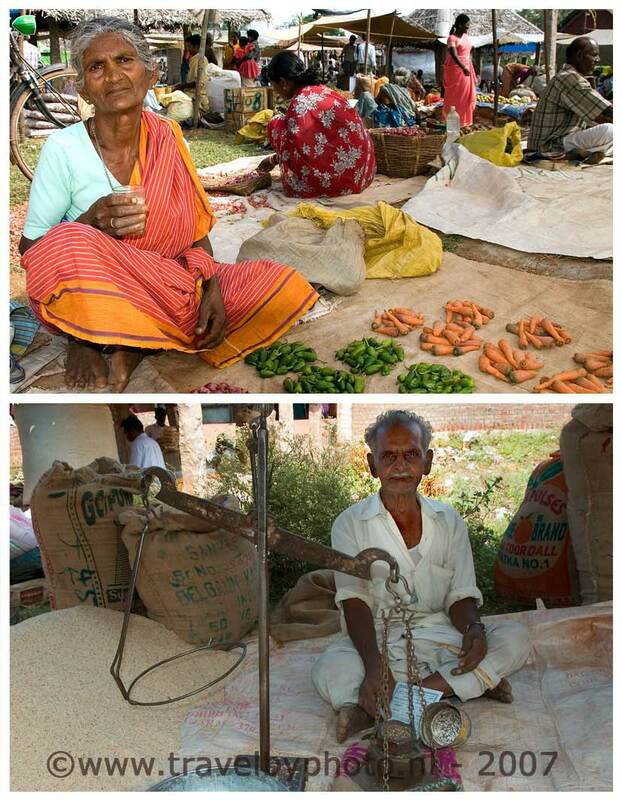 Visiting a market in India is always a great experience. The people don’t mind if you take a picture of them. A great feature of the digital age is that they can show the picture directly. Everyone is called in when you show the picture . They all have great fun and laugh a lot. We see many beautiful things, but also a lot of dirt lying around. We buy 2 bananas from a sweet old lady who sits somewhere with just a few bunches of bananas. The bananas cost a few cents, but we only have a note of 10 rupees (16 cents). The lady can’t change, and so she wants to give us the bananas! We don’t want that we insist to buy the bananas and so - as her alternative - she provides us with a whole bunch of bananas. We go for lunch to a exclusive and expensive restaurant to Indian standards. The price - aproximately 9 euros for two persons - is still very low to European standards!. For that money you get soup, a plate with bread, rice, and 11 (!) Sauces, 2 oranges, 1 lassi, and 2 coffee! This morning we also go to a Brass founder village. We look at the casting of the metal but this kind of events are wasted on us. We rather want to wander around in the village itself. Nice! We have some hotel soaps in the bus. If we give them to a mother with child she jumps of joy! In the evening we sit by the pool. Mhutu loves to chat about life in India. Today we take a public bus to the banks of the river Kauvery. That was fun! Loud music in the bus, an angry whistling conductor, and many beautiful people walking like ants in and out of the bus by every busstop! The bus is driving with brisk speed. We stop at a holy place by the river. 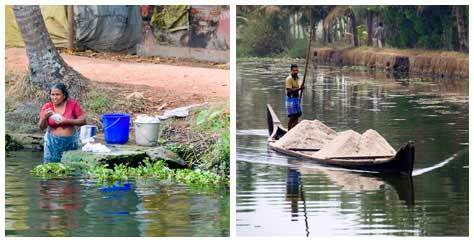 The river Kauvery is considered by the Tamils the southern Ganges. 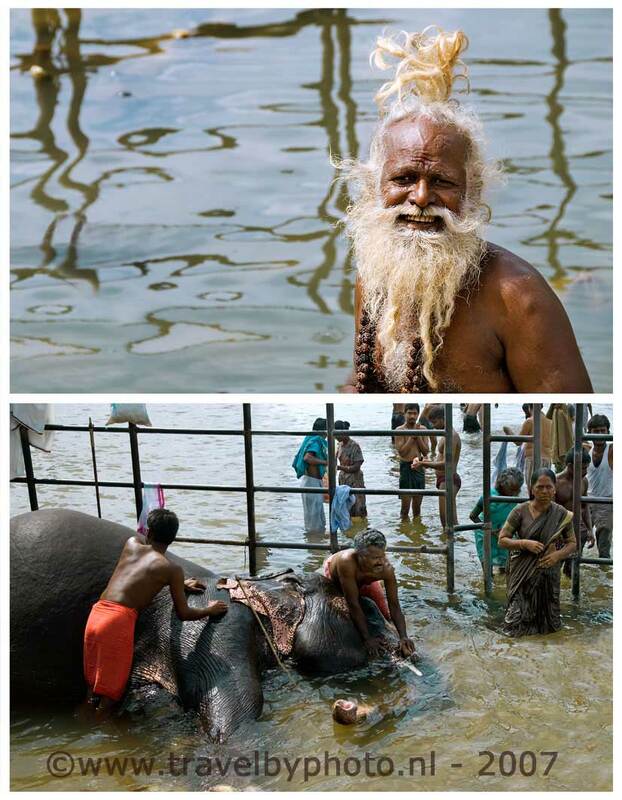 People are bathing in the river (and an elephant!). Worshipers make offerings to the gods. The elephant is coddled and crops. Occasionally his trunk appears above the water. He visibly enjoys. A wonderful spectacle of people who wash themselves or do the laundry. On a site near the river the most extraordinary things happen! Men who have a kind of blessing pronounce and sprinkle water, jars with strings around them with unknown content are cherished, blessings with flowers! Fascinating to see. Many rituals. After our visit to the banks of the river Kauvery we take a tuk tuk to the great temple of Tanjore. We get a tour by a priest. In the afternoon we have a delicious vegetarian lunch. 2x thali and a 2 liter bottle of water for 2 euros! On to the next temple, the temple of Ganesha (the elephant god). We have to climb many steps to reach the temple but it is worthwhile. In the hotel is a internet connection. Nice to get messages from the family at home. In the evening we go to a Bollywood film! It is nice. The people are excited, they bawl, cry, clap, laugh; all human emotions are spread out. It is also a very long film and we do not understand what the actors say of course. Therefore we do not stay until the end of the film. After the movie we go to Vincento. A very nice restaurant with good food but also with very slow service. At 8 o'clock a.m. we leave our hotel. 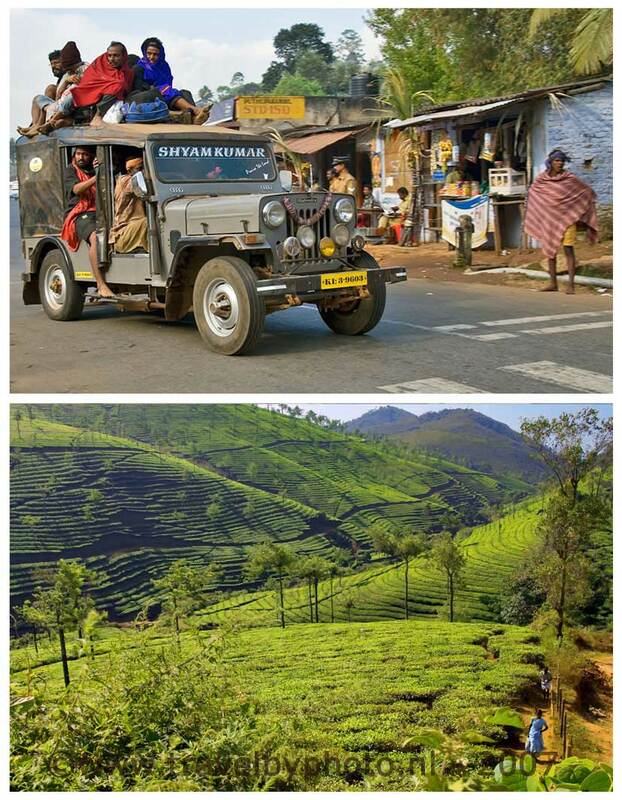 Today we will drive to Kodaikanal. A long trip. 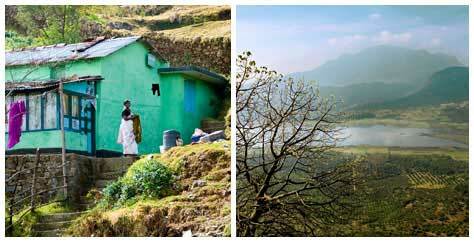 Kodaikanal is situated at 2300 meters altitude. 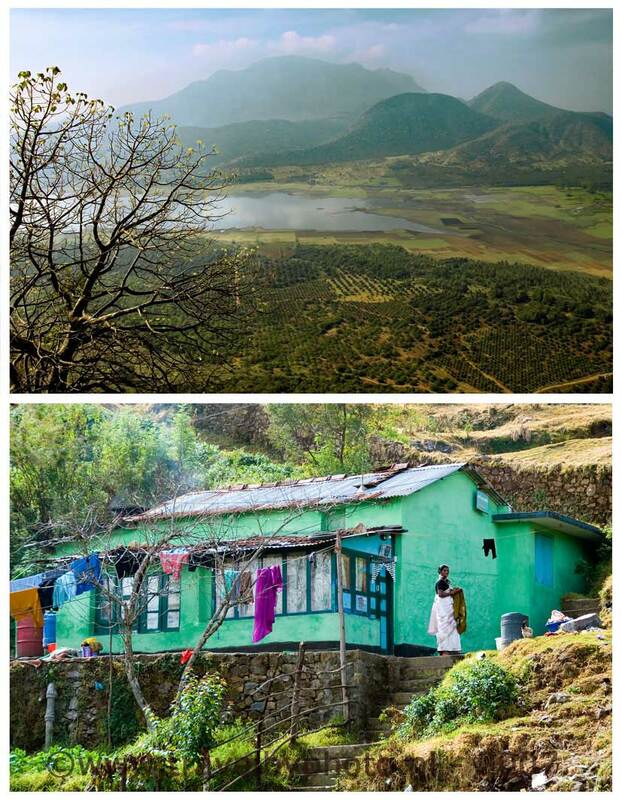 Many Tibetan refugees have built a new life in Kodaikanal. We make a stop at a week market. There are lots of goats, sheep and people who like it that we take a picture of them. We buy masala spices. Back to the bus. Sometimes we fall asleep, yet there is plenty to see outside. First, no spectacular scenery, but: temples, people working in the fields, thatched huts, people who live on the street, and suddenly somewhere a cremation. In the afternoon we have lunch. Quite a long ride. The last part of the tour the scenery changes into a beautiful landscape with mountains. Many flowers, monkeys and donkeys. We arrive at the hotel at 4:30 p.m. We are tired. That's why we take it easy for the rest of the day. We still have some wine so we drink a glass on the balcony of our room and watch the film and the photo’s we made until now in the camera. In the evening there is a camp fire and a dinner buffet in the hotel. On the program for today is a trek through the mountains. 7 km up and 7 km down. At first Ingrid didn’t want to go but she has changed her mind. We leave early in the morning to see the sunrise. The trek would be "very easy" according to Muthu our guide but it turned out that we had to walk on a narrow path along a deep abyss in dense fog. You can barely see where you walk. And so after already a few minutes walk, the first of our companions decided to go back because they were afraid. And indeed walking along this road was not responsible We sought an alternative route and ultimately we and 4 companions of us had a beautiful hike. We drink lemon tea at a little kiosk at the roadside where the tea was on the stove. We go along streams, over tree roots, we climb and descend. We arrive at a viewpoint for the sunrise, but there is not much to see because it is still foggy. Nice to see the clouds come along! When we walk further the weater improves and soon the sun is shining on it’s best. Only at the top of the 2300 meters high mountain it stays foggy. After we finished our trek we take a taxi to the Tibetan Brothers, a wonderful Tibetan restaurant. We had a delicious meal. Ultimately, we still had a walk of 20 km today! Back at the hotel we drink coffee and decide to take a walk around the lake. That was not a great idea, because our legs were tired, the circle around de lake is much bigger than expected and there are no terraces near the lake! In short; 5 of the last 6 km were too much. When we return to the hotel we take a power nap and order some french fries. We have no energy left to go out again. We go to bed early; next morning we have to get up early. Nice hotel, this Raj Hotel. Spacious rooms, nice people and cheap. Our 3 servings of fries costs 60 rupees or 1.10 euro! This morning we leave at 8 o'clock. Nice ride through the mountains! We stopped at a lookout point. Here the view over the mountains is beautiful. The weather is sunny, but also a bit hazy. We see a lot of monkeys. En route we stop at a brickyard. We walk a little ashamed at the site. Young but also very old men and women are at work. 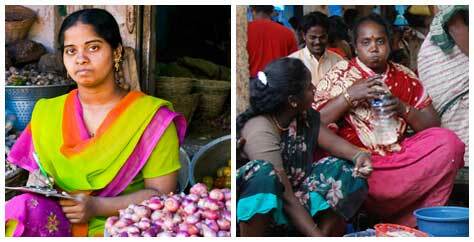 The women earn about 1 euro 50 per day. Particularly hard work! Walking back and forth, sometimes with 13 stones on the head! Just before the end of the ride we pass the border with the state of Kerala. We stop at a laundry. 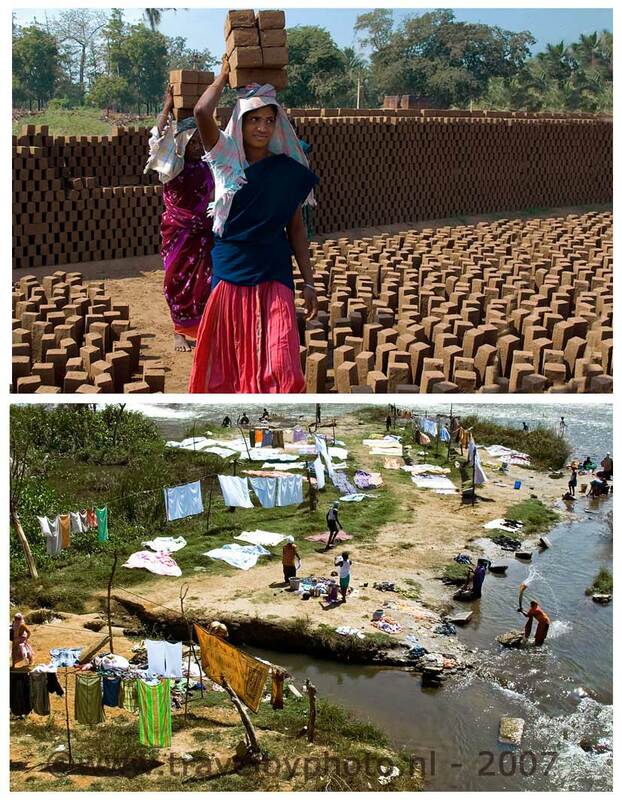 The wash for many people is done in the river. 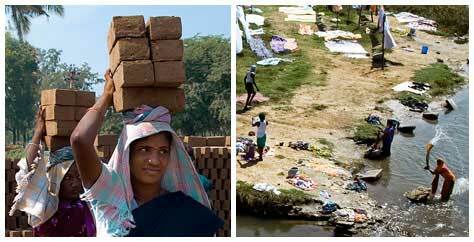 Especially the wealthier families have their textile washed by others. We arrive in Thekkady where we are received with garlands. We have a funny asymmetric room. We have lunch and go into the village. At 4 pm we leave for a spice tour, but that was not very interesting. We had visions of red pepper fields, but we just visited a botanical garden with some explanation about herbs and therein trees. By the evening we have an ayurvedic massage for one hour. We were delicious rubbed and massaged with oil. The massage ends in a steam cabin. You sit in a kind of box with only your head sticking out. During the massage you have to wear a kind of paper diaper. You can also have a head massage. We find that too much for now but decide to take another massage the next day, because it was marvellous and very relaxing. After the massage, we go back into the city. We buy a beautiful necklace. We also buy scarves. We don’t fancy to have a full meal, so we just take some coffee with a tasty pastry (50 cents for 2xkoffie and 2x cakes). In the room we eat some nuts and drink a glass of wine. Breakfast takes a while today. Not everything that is on the menu is available so during breakfast a staff member is send to do some shopping first. 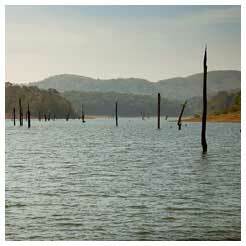 After breakfast we go to the Periyar park in Thekkady. It is a very busy place, many local Indian tourists too. We take a boat trip on the lake. It is a beautiful area, but not very exciting. We see otters, birds, a wild pig and a deer. After the boat trip we make a jungle walk. We cross the river in a bamboo raft and walk for 2 hours with a guide. Nice, many beautiful old trees, but we did not see a lot of animals. Only 2 large squirrels. At about 2 p.m. we are back at the hotel. At 3 p.m. we have our second massage. It was nice. Ingrid finds the stab in her navel less nice! We have dinner at a French Bakery. A simple homemade cabin. The front part serves as a restaurant. The hostess cooks delicious. She uses only fresh products. We eat aloo palak (Spanish with potatoes) and garlic naan. The weather is just right! Never too hot unless you walk a long time in the sun and in the evening it is just fine without jacket. After a hearty breakfast in a small restaurant called "Wilderness" we leave at 8.15 a.m. for the next stage of our tour. Along the way we would stop at a tea factory, but today is a holiday so on arriving the factory unfortunately proved to be closed. We stop somewhere in a village. On a intersection dozens, perhaps hundreds of pilgrims packed in cars pass by. They have flags and pictures of krishna with him. The people are cheerful, and waving to us. They are dressed in black or orange. En route we have lunch in a restaurant. According Muthu most dishes are too sharp for us in this region. We eat biscuits, bananas and rice balls. 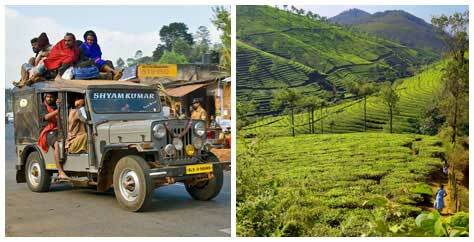 The landscape is hilly and dotted with tea plantations. We stop at a rubber plantation and watch how the rubber is harvested. We are getting closer Cochin on the Arabian Sea. Temperatures are getting higher. About 33-35 degrees Celsius (91.4° to 95° F) here, and that’s hot on a long travel day! When we arrive in our room at the hotel in Cochin it shows that the floor is wet because of a leaky air conditioner. We change room and refresh ourselves a bit. We have only a few minutes before we go to the theatre . 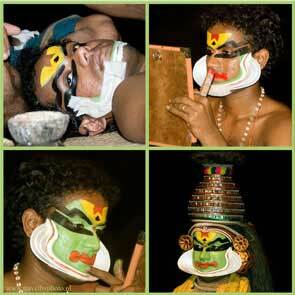 Cochin is the center of the famous dance drama of Kerala, the Kathakali. As we arrive at the theatre one of the employees of the theater is drawing sand paintings on the entrance floor of the theater. Before the show begins you can watch how the actors are painted on stage. You can see it from close. The paint is made from natural materials. Also the (rice) glue they use to pasted paper forms on their faces. Very special to see. The main forms are painted on the face by another but the finishing touch is done by the artists themselves. There is a peaceful and serene atmosphere on stage and oil lamps are lit. Eventually the show starts. It is quite long show, according to some group members even too long, but we stay till the end. A wonderful spectacle. A combination of music, dance and play. Beautiful costumes. Great performance with many gestures. Hands and feet are playing along. The bad and angry personage has something put in his eyes done, so they become completely red for a few minutes! Even the intestines are ripped from the devil on stage! After the show we have dinner with the group. Muthu and the driver join us for dinner. Beer is not allowed here, but an Indian is resourceful, so we get here the beer served in .... white teapots and cups!! Breakfast in the hotel is very chaotic today! We are with four at a table and order toast. No, no toast today, no cake..... no breakfast. 6 staff members consider what to do. One of them has a brilliant idea; let’s buy bread, and so one of them is leaving to get some bread from the shop. After a while we have our breakfast. But ..... moments later, 4 new guests arrive. They order ...... toast. No, no bread today. The same process repeats. Not very efficient! 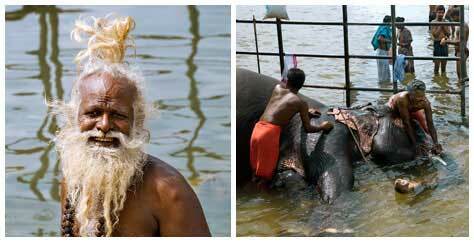 A very entertaining spectacle, but our guide Muthu will arrange breakfast for the next day. Today we a city tour in Cochin on the program. We first go to the nets. A special guide was added to the group. If you don’t hire a local guide the travel company will be in trouble with the unions, we hear. The guide takes us to a Dutch church and a Dutch cemetery. The tour continues with a toilet stop in a very expensive gift shop. We are invited to buy some souvenirs. Not so. Moreover, the people here are very intrusive. We leave the tour and go for a walk ourselves. We wander around in the Jewish Quarter with a beautiful old synagogue we visit. There are very old, beautiful tiles on the floor. It is great to walk around in the Jewish Quarter. Many unique antique shops. We buy a nice wooden nandi (holy bull statue) and we visit a garden restaurant behind a small shop where we can drink and eat soup and noodles. A little later we find a fancy restaurant with a seaside terrace. There we sit down and take our time to watch the raptors overhead on the lookout for prey! Lovely here! By the end of the afternoon we go back to the famous Chinese fishing nets to make some more photos/film in the beautiful soft evening light. It's fun to walk on the quay between the nets and fishing boats. The catch at night is bigger than during the day, so the real fishing starts after sundown. During the day the tourists are the biggest catch. We hear that you have to watch out. You will be invited to watch the net on a scaffolding, but when you accept the invitation the bill will be presented afterwards and it will cost you a lot of money. 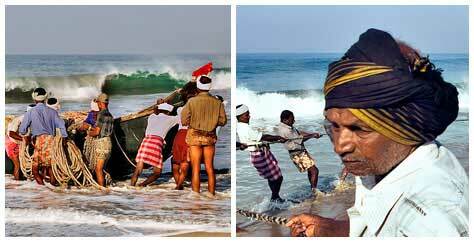 We therefore stay a little bit at distance when the fishermen call and admire the work that is done just from the shore. We stay for quite a long time before taking a tuk tuk back to the hotel. We had a great time in Cochin. 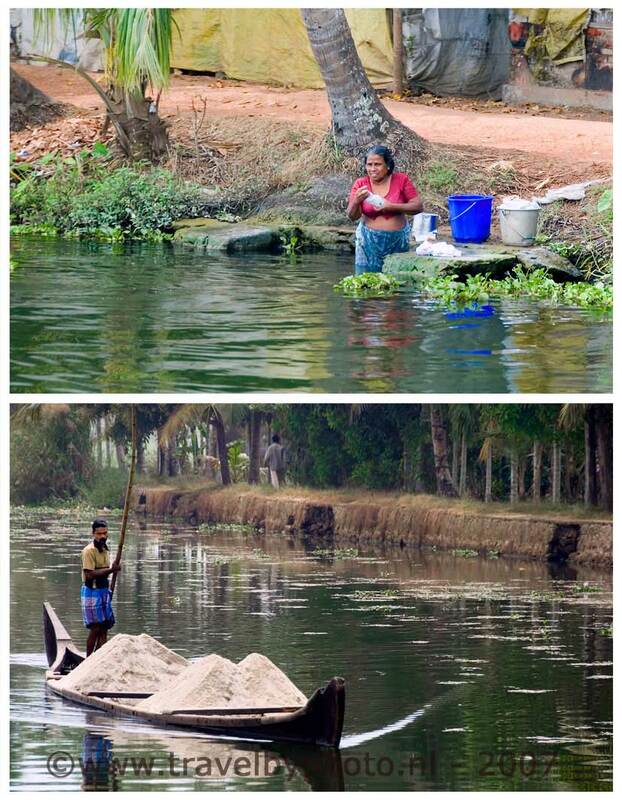 We can really recommend Cochin. Departure from the hotel is planned for 10 a.m. That feels like a long sleep! Around 11:30 a.m. we arrive in Allepey. We board on a relatively small boat. Only our group is on board. We find a nice spot on the passenger deck. 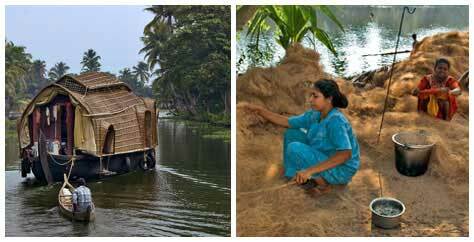 It is a fun and relaxing 3 hours boat tour through the backwaters of Kerala. Lots of interesting things to watch! We see the traditional "houseboats." They are here for a long time, but nowadays they are very chic, sometimes even with air conditioning and solar panels! We see a lot of other types of boats too. Lovely trip. 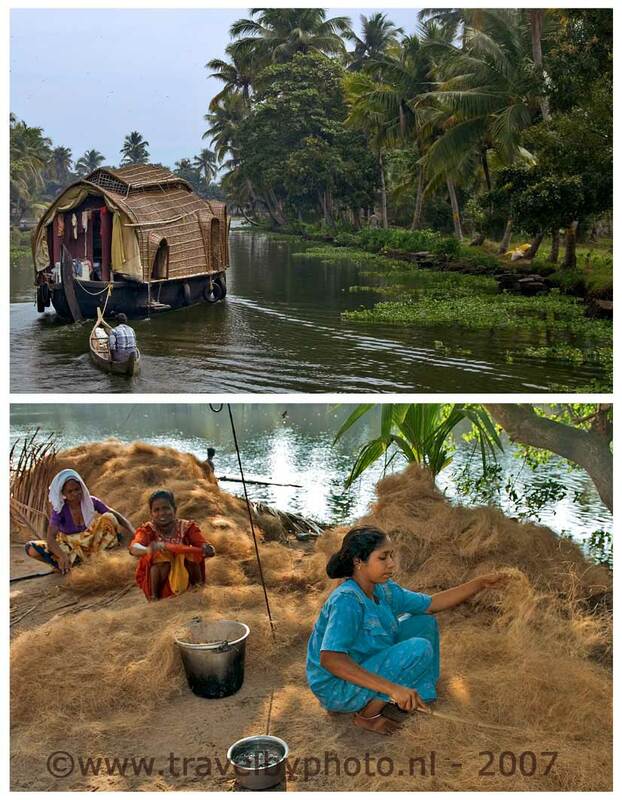 The daily life of the inhabitants of the villages alongside the canals of the Lagoon takes place on and around the water. We see people in the water, often to the neck. They dip, do the laundry, brush their teeth there, etc. Whole groups of ducks are bobbing around in the water. They ducks are bred and herded here. There are also a lot of Ibises; beautiful birds. Around 3 o'clock we arrive at our hotel. Wow, what a nice and unique spot here! We are brought with a boat from the hotel to our room situated on an island . It looks great! We relax at the frontside of our room, on a chair near the water under a banana tree. In the afternoon we make a walk to the beach. The beach appears to be not very special, but the walk through the villages is fun. People live here from the coconuts. They work the fibers of the nut to a kind of flax. Many coconut trees here. We have dinner with the whole group today. Very good food again. The room service is great: If you place your order they bring it to you on a ferry from the hotel bar at the other side of the river! What a life! Debbie a member of our group has her birthday today so we have breakfast together. We leave at half past 9 with 2 small boats. A fun trip through 2 small creeks. We go ashore at a coconut plantation and drink fresh coconut milk from a coconut. The coconut was just removed from the tree for us, really fresh. We pass a small business where they fluff the coconut. The people make rope. We are invited to try to make a rope. Ingrid does not think the piece of the string she produced has passed the testing. Nice tour. At noon we had a lunch offered by Shoestring. Delicious! After lunch we went with Peter, one of the group members in a rickshaw to the snake temple. The temple is impressive. Apparently it is sometimes very busy, but now it's empty. No snakes and no people. Only images of snake heads, most Cobras. Beautiful surroundings here. En route we see an elephant procession. The elephant arrives with the priests to a blessing ceremony. We are also invited to come and look. A lot of fire, music and rituals for a house. When we are back in the hotel, Jan takes another massage. In the evening we chat with Mhutu about life in India and have a little party in honour of Debbie 30th birthday. The airco of this hotel does not work. As a compensation we get the next morning a complimentary breakfast. 7:30 a.m. breakfast. With a ferry to the hotel where we are picked up by a larger boat for a small cruise to a lock, where our bus waits for us. It is hot today! 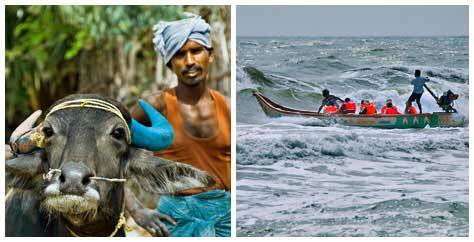 We travel in the morning to our next destination Kovalam. We have lunch on the rooftop of the hotel. In the afternoon we go to the beach and hire lazy loungers and a parasol. Jan swims in the sea. There are very high waves. ' At the end of the afternoon we walk around at the small boulevard of Kovalam. We order various garments that are custom made here from beautiful fabrics. It is very beneficial! Fun. We drink a cocktail, enjoy the sunset and have diner. At ten p.m. we are back at the hotel. Nice room with airco. As soon as we wake up we go to the beach. The beach is nearby the hotel. 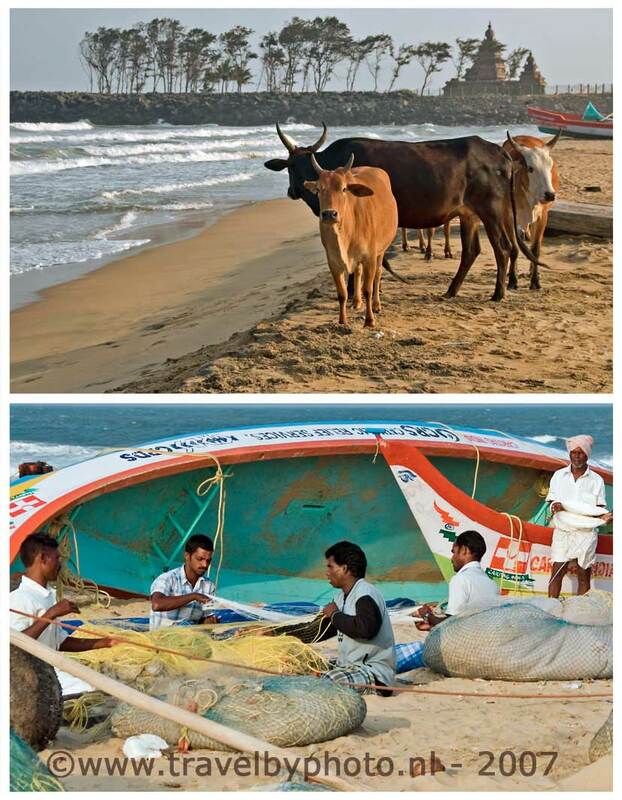 At the end of the first beach is a second beach, where fishermen are busy. A small boat comes ashore. About 50 fishermen are pulling a huge net to the beach. It is a lot of work. The rhythm of the pulling is indicated by a chanter. 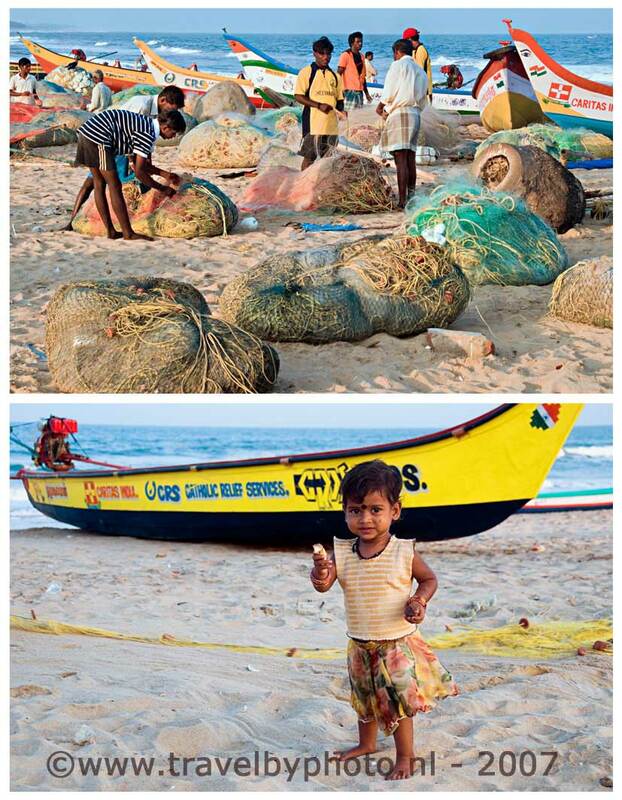 When they finally have the net on dry land, it appears that the catch is very small; only some very small fishes are caught! It is a nice event to watch and the morning light is beautiful. We have breakfast at the German Bakery. Delicious fresh bread, cheese, jam and tea. We also take a delicious German coffee! Filtered, no nescafé and that is very rare in India. We walk back to the hotel. We put on our swimsuits on and leave for the beach. We have a nice cool drink with 5 of our fellow travellers before we settle on the beach. We hire a nice lounger and parasol and have a nice lazy holiday with some sunbathing, reading and swimming. Ospreys overhead, high waves, bright sunshine and delicious water. What more can you wish. Lifeguards keep an eye on the sea conditions. Red flags mark the area where you can and where you can’t swim. Although we try to keep out of the sun we are already quite dyed! 7:00 a.m. breakfast, 7:30 a.m. on the bus for our next destination Madurai. It will be our last trip with the bus/chauffeur. It is a long travel day. The bus can’t drive fast because of roadwork. En route we have several stops for refreshment, food and drinks. One of the stops was at a very old wooden temple and one was for lunch. For little money we enjoyed a rich thali meal. Many cups filled with sauce, bread and rice. Delicious! At 4 p.m. we arrive at our hotel in Madurai. It is a real city hotel; not very special and a little filthy. Together we make a walk in the surroundings of the hotel. The city, the tempels and the street live looks nice. Many beautiful people. We join Mhutu and the others around half 6:20 pm for a temple tour. Unfortunately, a separate local guide will be present again. With the local guide we go to the temple. After the tour the local guide tries to attract us into an expensive store, but we don’t go. We stay in the temple and walk around at our own pace. We are obsessed by the crowd worshipers that enter the temple. There is a lot to see and we decide to come back together again next day. When we return at the hotel we have dinner at the rooftop terrace. It is very busy but the food is very tasty. We had a good night sleep. 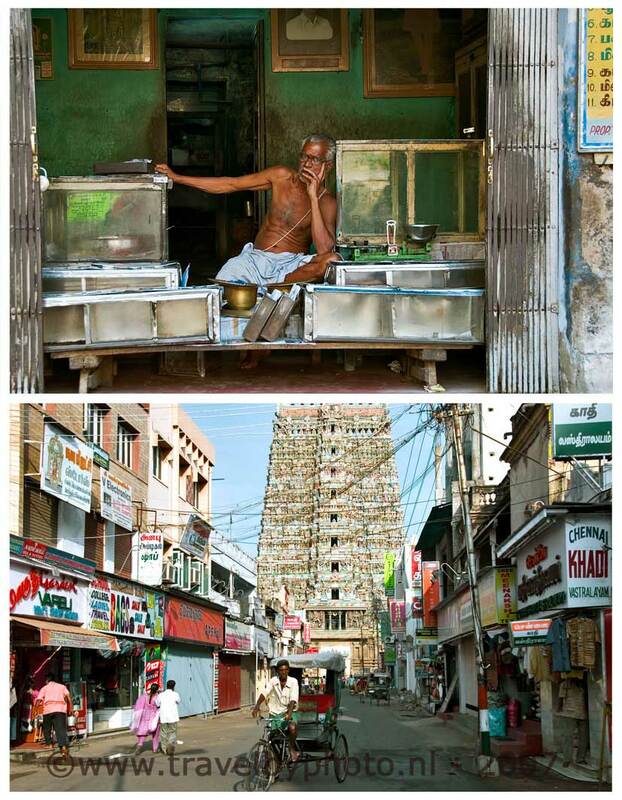 After breakfast we return to the main temple of Madurai. We walk around for quite a while. We enjoy the crowds at the temple. A holy man sits at the front of the temple. We take a photo of him. He doesn’t mind, laughs and says a prayer. After our visit to the temple we visit different tailor shops, and order some custom made clothes. The ordered clothes can be retrieved in the evening. 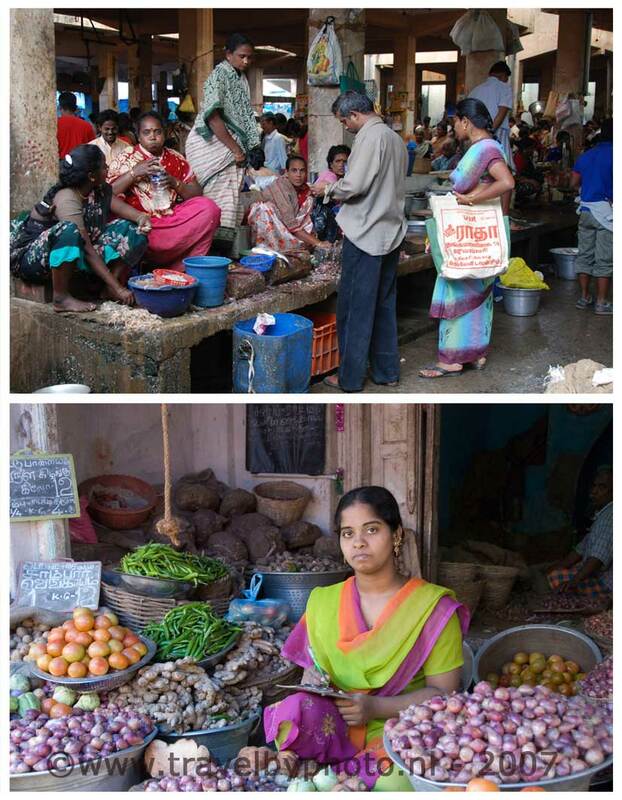 We also visit a vegetable market. The people are all very friendly. When we leave the vegetable market we find another lively market street with some bananas and meat and .... lots of flies. We get bananas and tomatoes. At the end of the day we re-enter the temple. A lot of sleeping and eating people, priests and children with shaved and powdered heads: the gave their hair to the gods. Finally we collect our custom made clothes at different shops. 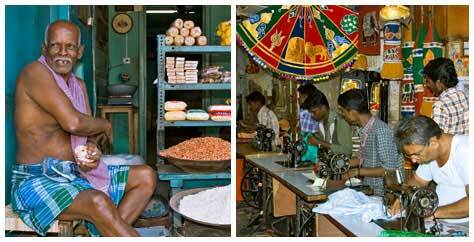 The shirts of Jan are made on a market near the temple, where more than 300 tailors work side by side! We are satisfied with the result and go back to the hotel. Our feet really can use some rest after such a long day wondering arouround in the city. Today we have to get out of our bed very early because we have to catch the train to Mahabalipuram. At 5.45 a.m. we gather packed and ready in the hall. Our luggage is sent to the station by taxi. We ourselves will walk to the station. We got a take away breakfast from the hotel. Our train arrives after a short wait at the station . It is a quite long, and utterly full train! There are bars on the windows. You can’t possibly leave the train if there is an accident. Quite hazardous actually. The benches in the train are hard. Two of our 13 group chairs are occupied by two Indian ladies. They don’t want to leave, but Muthu eventually persuaded the ladies that they don’t have a choice. Resent they disappear. Around 7 pm we leave and around 14.00 p.m. we arrived. 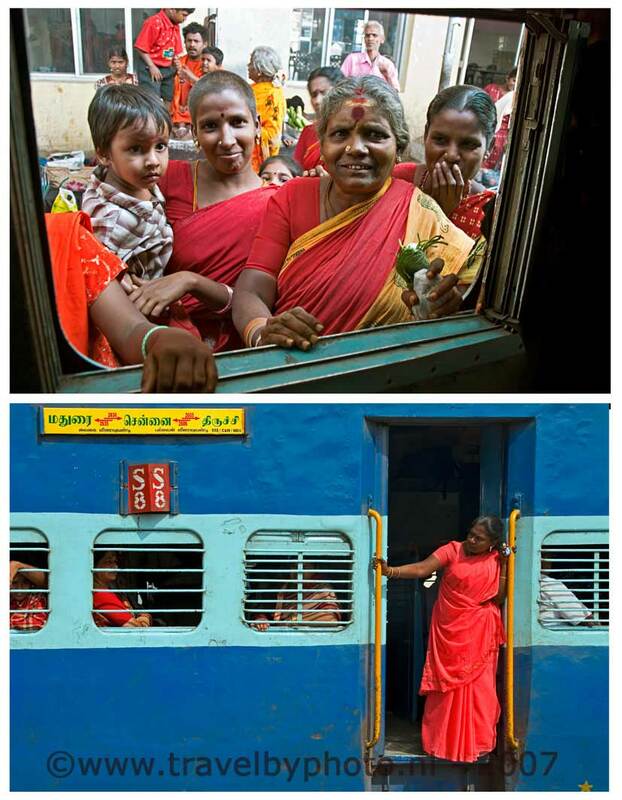 Traveling by train in India is an adventure. We have nice journey. There is plenty to see inside and outside the train. Every half hour servants come along in the train with complete meals, cold and warm drinks and all kind of snack in paper bags. 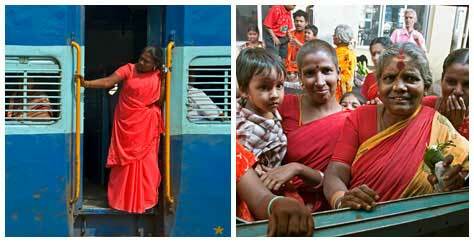 When we stop at a station curious people throng before the window. Again a lot of pilgrims often dressed in orange and red. They wave enthusiastically at us. When we finally arrive at Mahabalipuram station a minibus and a taxi bring us to the hotel. It is a ride from about 45 minutes. We have a nice room. After unpacking we take a walk to the beach, but the first beach we see is somewhat disappointing. Nobody in swimsuits and no umbrella to find. There is also no terrace or bar where we can drink something. We decide to go back to the hotel. We have a drink in the hotel and hear that we have to walk an other road to find a better beach. And indeed the other beach is considerably more fun! Many shops and nice eateries. There are many (especially new) fishing boats on the beach. 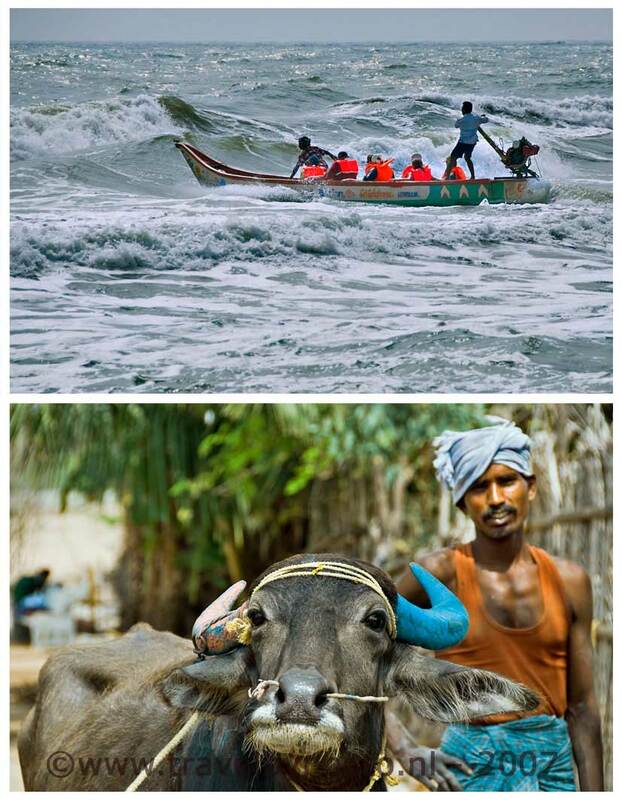 The boats are a gift from aid organizations after the Tsunami. 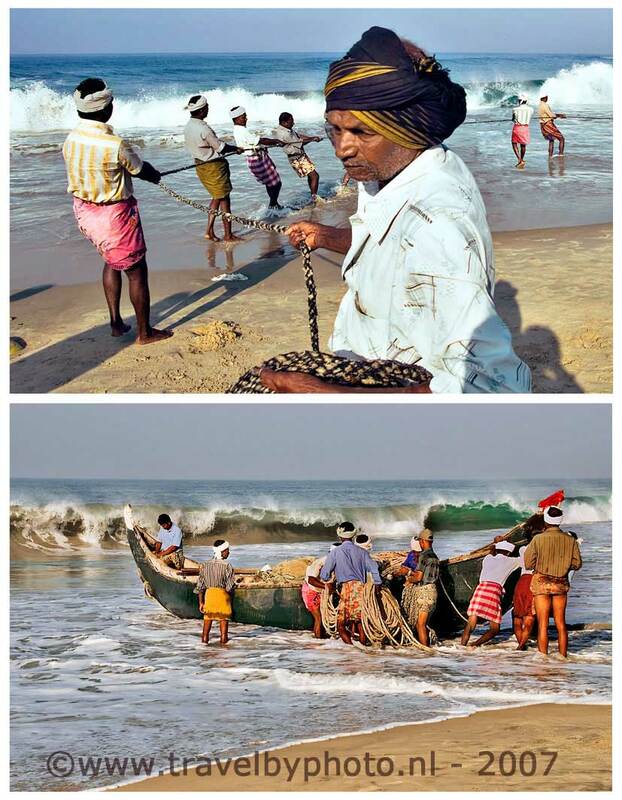 The fishermen and their families are busy repairing the fishing nets. Beautiful soft evening light. We walk around for a while. It is a very pleasant walk but still no possibility to swim. We go back to the hotel. At 8:30 pm we return to the street leading to the beach, because now we know that there are a lot of restaurant in that street. We have dinner at the Moonrakers restaurant. Two fellow travellers join us for dinner. Astrid, one of our companions has an inflamed eye. She goes to the hospital with our guide. 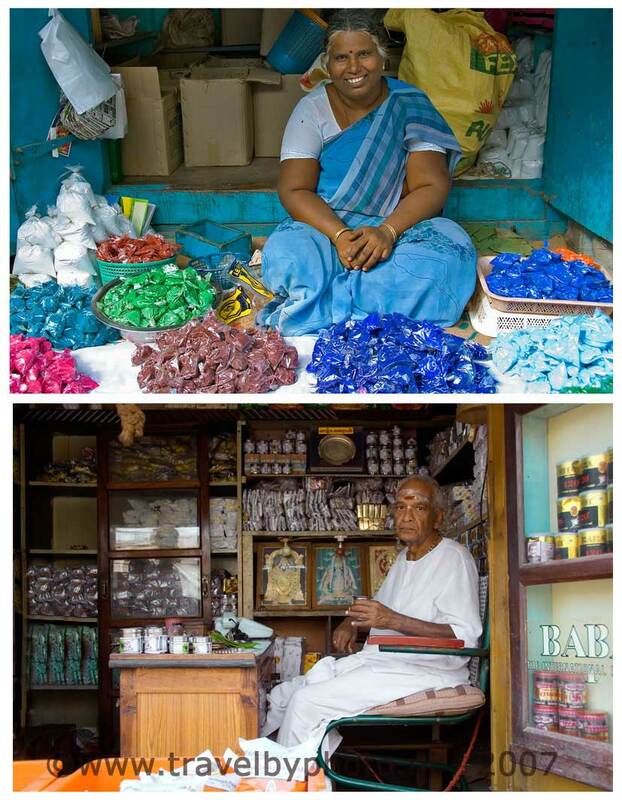 She is seen by 5 different doctors; the total bill for consultation is 50 rupees and the eye drops cost her 34 rupees. For the price of half a pack of cigarettes she had total care and the treatment was adequate. Her eyes were quickly healed! We get up early and enjoy a buffet breakfast. We will make a bike ride today. The bikes are picked up. Ingrid sits on a bike that has the height of a children's bike, but most bikes here are small. Indians simply are a lot smaller than we are. It is hot, the bikes and roads are bad so the trip is tiring. We have to work hard but it is a fun experience! We stop in a village. 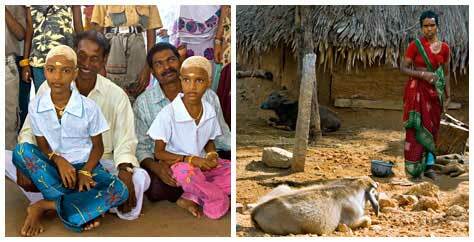 We take our time to explore the village and are witness of a ceremony where 3 girls are shaved. Thereafter, the head of the girls is powdered. 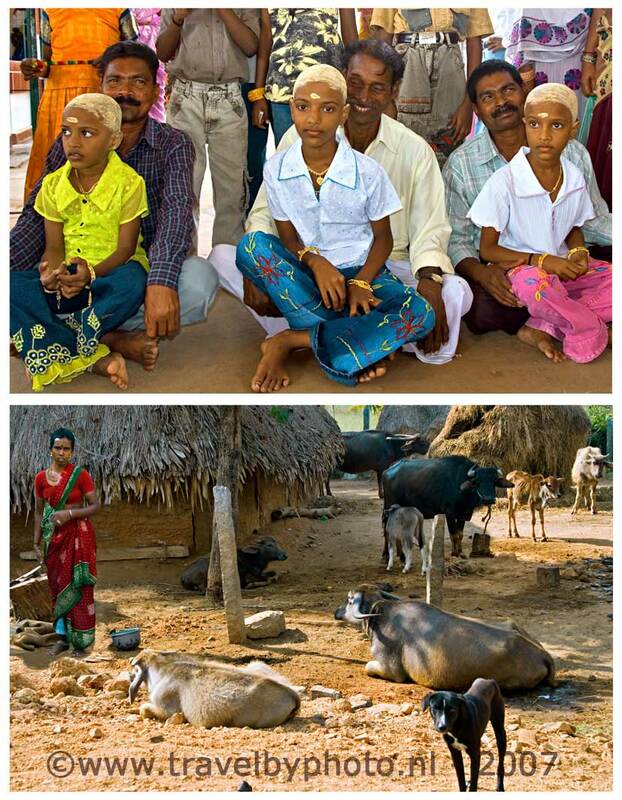 The girls sit on their father's lap while their ears get pierced with golden earrings. 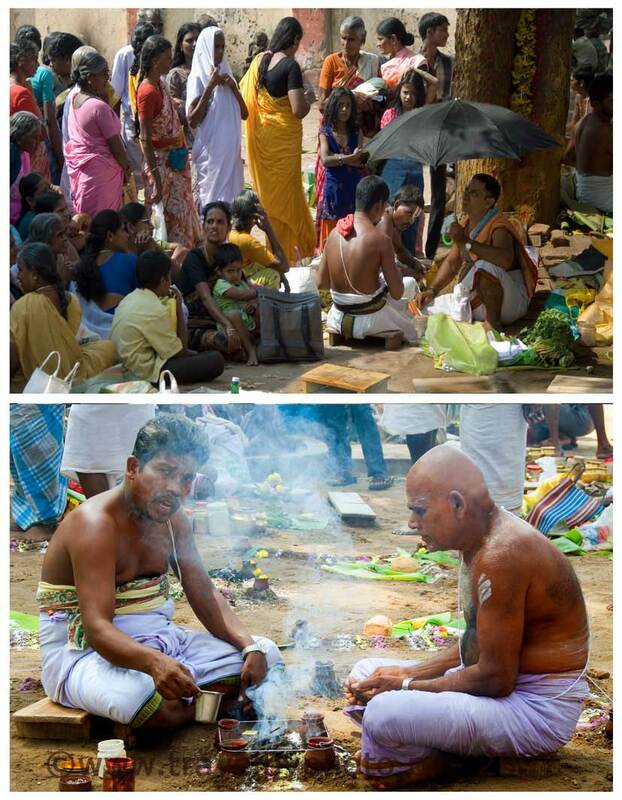 It is a ritual in which their beauty (hair) is sacrificed to the gods. Nice to see daily life where the families live in their lovely cottages with a small little lifestock. We also see school children in their school uniforms. Many children beg for sweets or pens. En route we stop at a lake with a sacred tree. We see cows with beautifully painted horns. We see many rice fields and palms. Beautiful nature. Too bad waste is thrown anywhere here. We eat in a private home. The family serves good food on a banana leaf. Rice with different dishes are to be eaten by hand. Delicious. After this pleasant tour we return pretty exhausted, also because of the heat, back to our hotel. At the hotel we rest for a while before going to the beach again. First we to a tailor. 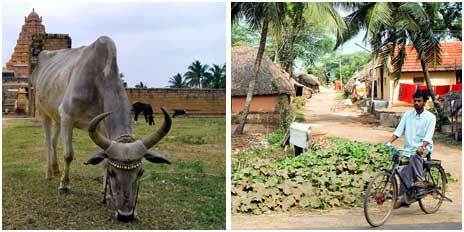 Mahabalipuram is like Madurai famous for custom made clothes. We can’t resist to buy some more. There are a lot of fun fabrics to choose from. At the beach we have drink at a bar before going back to the hotel. In the evening we have dinner on the roof of the hotel with Mhutu, his family and the whole group fellow travellers. Mhutu was a good tour guide. Tomorrow our paths will split. Mhutu will join a new group. We make a phone call to our daughter Marjon in Holland. It freezes in Holland! Fortunately everything goes well at home. 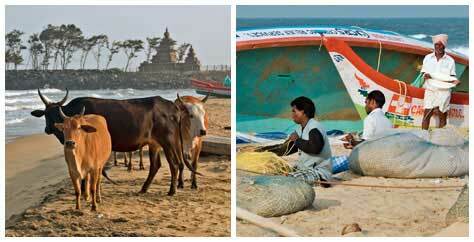 At 9.45 we go with 3 taxis to a fishing village near Mahabalipuram. This village is heavily affected by the tsunami but is now quite composed. In the village we board on a fishing boat. We will join the the fishermen to sea with 2 boats. The sea is very rough today. Strong winds and high waves cause many gallons of water in the boat. the The boats are pounding in the surf. The moment we are on the high seas fishing nets are thrown out. After half an hour the nets are hauled back. Meanwhile some of us get pretty sick. We don’t suffer sickness and love the swell! A very special cruise under special circumstances! Back to the beach is going very fast! We have lunch in the village. The people of the village has prepared the fish we caught by ourselves and serve it with rice and several dishes on a banana leaf. The food was very tasty, but - to be honest - after 3 weeks of Indian food, we start getting hungry to continental food again. We walk around in the village. The money earned with these excursions is invested in the education of the children from this village. We paid 20 euro’s the man. A lot of money for the people here, but it is worth the money. Around 14.00 pm we are back at the hotel. We take a break in the hotel. A little later we make a walk into the village. Back to tailor- and souvenir shops. Plenty of choice here. Most tourists walk in clothes that are made here. We walk away along the beach and walk for the last time past the fishing boats. In the room we make our suitcases ready. Tomorrow will be our last day of the holiday! Last day. On our last day in Tamil Nadu we make - separate from the group - an excursion to a special temple nearby. The temple is at top of a hill. We climb to the top. There is a lot of activity in and near the temple. People bake, cook, sleep, chat etc. Many pilgrims. On the stairs a lot of beggars and also families with children. 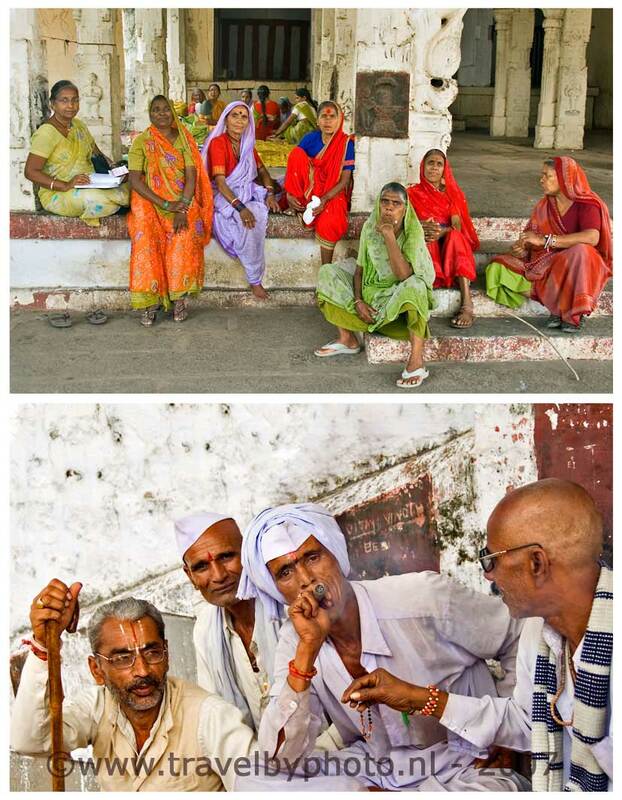 On the steps of the temple also a group of men smoking an opium pipe. Upstairs you have a beautiful view over the surroundings and some temple complexes. We walk through the small town at the foot of the hill and take a taxi back to our hotel. Visiting the temple was a good activity for such a last day here. In the evening, we are picked up late in the hotel for transfer to the airport where our flight leaves in the middle of the night. Everything goes well. A wonderful holiday is over!